This is a great idea to get your kids in the kitchen. I made these last week for my high school students and they loved them! It is something that can be thrown together in a matter of minutes and the next thing you know you are enjoying them with a cup of Joe! It makes about 30 at about 80 calories each with is not too bad. So if you were like me with some canned biscuits hanging around in the refrigerator these are winners. The down side is that some of the cans of biscuits are a little difficult to separate into three parts. I found that it is much easier to separate the dough when it is very cold. Take them out of the refrigerator when ready to use. To speed up the process get yourself some help. Three to four helpers is not a bad idea. Line cookie sheet with parchment paper or lightly grease. In a small shallow bowl, combine sugar and cinnamon. Mix well. Separate dough into 10 biscuits. Separate each biscuit into 3 to 4 layers. Dip each layer into melted butter. 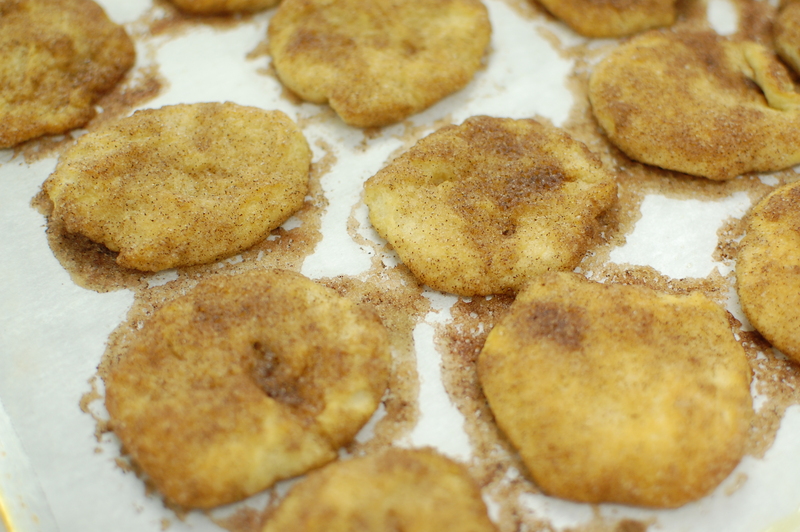 Coat both sides with cinnamon sugar mixture. Place each 1 inch apart on the prepared cookie sheet. Bake at 400 degrees for 6 to 8 minutes or until golden brown. Serve warm. I learned that you can use leftover canned biscuits and it is easier to cut them when they are cold. These are really quick and easy snack for my little sisters. I love them! This is a quick and low calorie snack that is easy to make and doesn’t require many ingredients. I can’t wait to try this at home. I learned that you can cut those biscuits into small pieces ! These are so easy to make ! and they are so good!! these are a really quick and easy snack, i cant wait to make them! 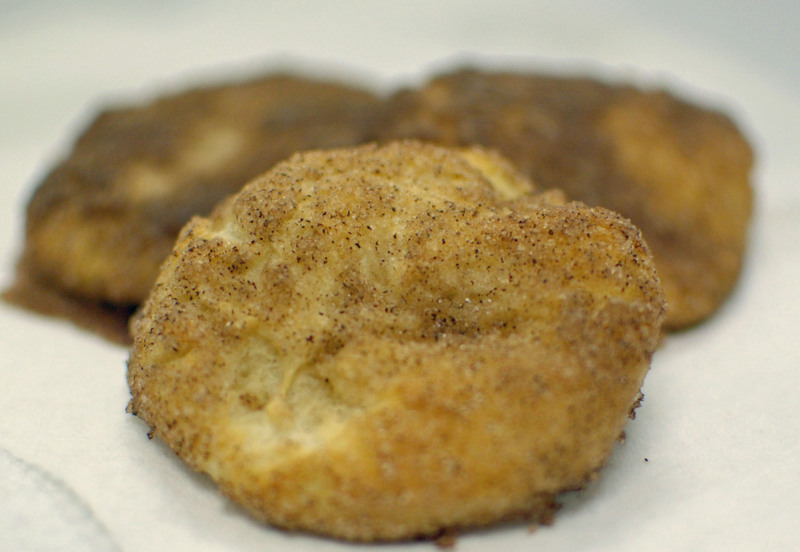 I learned that you need to coat the cookie dough with cinnamon on both sides. I learned that these snacks are very easy to make when in a hurry or when you desire something sweet. This is a very quick and low calorie dish. It also uses very few ingrediaents. I learned you need to heat your oven to 400 degrees. very simple, quick, easy, grat tasting! Very easy simple and tasty. It is something nice and easy to make when you are in a hurry. I learned that you can use leftover canned biscuits because its easier to cut them when they are cold. I learned this is a quick and easy thing to make and a good way to get your kids in the kitchen. I learned that it is easier to separate the dough when it is very cold. I learned you could separate biscuits into 3 or 4 layers and it is easier to do when they are cold. I learned that this is super easy to cook, you can use leftover canned biscuits, and that it is easier to cut them when they are cold. It can be difficult to seoerate the biscuits so freeze them first. I learned you shouldnt leave the dough out to get warm. I learned that this sweet treat is very simple, cheap, and quick to make. I learned that these are very easy to make and are a great snack. I learned that you use biscuits to make these. i learned that you need to leave the dough in the fridge till ready to use it. I learned that they are about 80 calories each and it makes around 30. I learned it is easier to cut them when they are cold. They look brown, crunchy and pretty to me! This is a quick and low-fat snack. I learned that you could use ready-made biscuits or make your own. It tastes really good, and it may be the quickest snack to make. I learned that this is an easy snack to make for everyone. I learned that some of the cans of biscuits are a little difficult to separate into three parts. So make sure that you be careful not to break. Who knew it was so easy to make a delicious dessert of so little ingredients? I learned that dough is easy to pull apart when cold. I learned that these are easier to do when cold! Me and my friend made these and they where sooooooo good. I love these things.